Next to the mighty Mississippi, the longest and once most important river in Mississippi is the Pearl, which runs through two-thirds of the state. It rises near Edinburg in Leake County and twists its way 485 miles (190 as the crow flies) through Mississippi to the Gulf of Mexico near the Rigolets. The Pearl drains nearly a fifth of Mississippi’s land area, seventy-eight hundred square miles, as well as nine hundred more in southeastern Louisiana. About thirty miles from the Gulf, it forks into the West and East Pearl Rivers, separated by the Honey Island Swamp. The East Pearl marks the boundary between Mississippi and Louisiana below the thirty-first parallel. American Indians had lived along the Pearl’s course for two millennia before Spanish explorers discovered the mouth of the river in 1519. In 1699 Jean-Baptiste Le Moyne, Sieur de Bienville, named the stream La Rivière des Perles, a translation of the Acolapissa Indian name, Taleatcha. In 1732 Louisiana governor Étienne Boucher de Périer directed Lt. Sieur Louis Joseph Guillaume de Régis du Roullet to explore the Pearl River from source to mouth. Régis did so between 18 July and 10 August, recording in detail nearly every one of the watercourse’s features. It was a land empty of humans, possibly because of seventeenth-century wars between Choctaw and Chickasaw and possibly because Hernando de Soto’s expedition had spread European disease two centuries earlier. At a time when water transportation was generally easier than overland travel, the Pearl promised ready access to the interior. However, Régis encountered a huge draft of driftwood choking the lower river in 1732, much as American surveyor Andrew Ellicott did in 1798 while mapping the thirty-first parallel, the boundary between the US Mississippi Territory and Spanish Louisiana. After the War of 1812, American settlers crowded into the vacant Pearl River Valley and petitioned the government to clear the river for traffic. Area residents then seized control of Mississippi’s government from the older Natchez District. Although Mississippi’s first territorial capitals were located at Natchez and neighboring Washington, those that followed were on the Pearl—briefly at Columbia and Monticello and finally at Jackson. Obstructions below the thirty-first parallel were cleared early on, but Natchez residents blocked clearance farther north until about 1830. In December 1835 the Choctaw became the first steamboat to ascend the Pearl to Jackson. For the next twenty-five years steamboat traffic thrived on the Pearl, occasionally even above Jackson. The 1840s and 1850s constituted the golden age of steamboats on the Pearl River, with the Jacques Dupree, Irene, Mad Anthony, Ondine, and others calling regularly at Pearlington, Logtown, Gainesville, Columbia, Monticello, Georgetown, and up to Jackson. Much of the finished material for the State Capitol, completed in 1842, including copper for the dome, came up from New Orleans on Pearl River steamboats. By 1856 the Pearl, which had been crystal clear, became threatened environmentally. Planters and rivermen had cut off river bends to increase the water’s flow rate and to shorten distances, but this loss of pool increased flooding. In addition, timber clearance on the banks increased silting, erosion, sunken logs, and malarial fever. Nevertheless, the Pearl remained a key transportation highway until the Civil War. After the war, railroads challenged river transportation. The Illinois Central was first, with its new towns of Osyka, McComb, Crystal Springs, and Hazlehurst. Then, in 1884, the New Orleans and Northeastern (now the Southern) drove up through the Piney Woods. Its whistle stops became the towns of Picayune, Hattiesburg, Laurel, and Meridian, serving the burgeoning longleaf yellow pine industry. Older Pearl River towns shriveled on the vine. Beginning in 1880 Congress asked the US Army Corps of Engineers to restore navigation on the Pearl River, but after at least three major efforts the Corps gave up, removing its last snag boat, the Pearl, in 1922. Much of the flow had already been diverted from the East Pearl to the West Pearl, leading to acrimony between Mississippi and Louisiana. Picayune conservationist Mansfield Downes led an ultimately successful effort to restore the historic flow and save the devastated river. 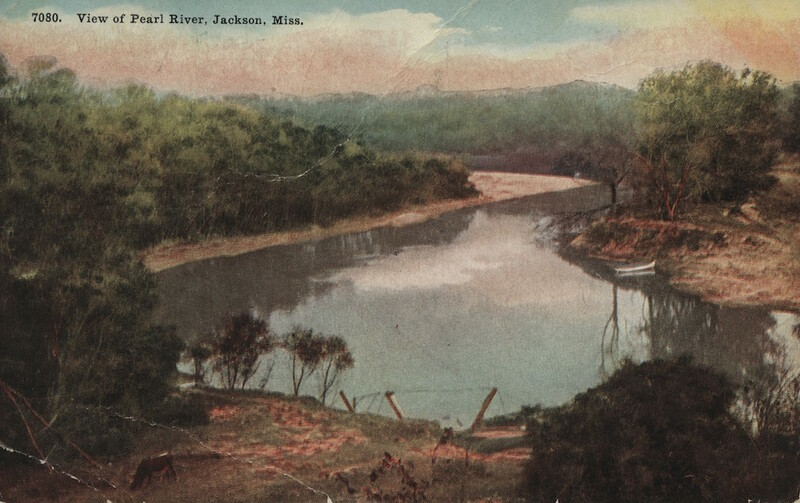 Today, Mississippi’s historic but sullied Pearl River remains important for three reasons. Near its source at Philadelphia, the Mississippi Band of Choctaw operate their profitable Pearl River Casino. Just above Jackson, the Ross Barnett Reservoir furnishes drinking water and recreation for the metropolitan area. And near the river’s mouth, including the site of old Gainesville, the Stennis Space Center has served as a key National Aeronautics and Space Administration facility since 1961.